Electroplating is a form of metal plating which is used by many industries in a range of capacities which include the aerospace, automotive, army, space, medical, electronic and engineering sectors, to name but a few. It is useful due to the fact that it is so versatile and lends itself so because of its electrochemical process where metal ions in solution are bonded to metal substrates by means of electrodeposition. Pre Electroplating, all parts must be thoroughly cleaned and then a process of chemical baths must be followed so that the parts can be prepared and activated so that the adhesion for the strong bond can take hold and become effective. This is key in the electrodeposition process. Many variables must be monitored closely during the electroplating bath process, such as the power supply which provides a direct flow of current to the parts in submerged. This enables ions to be attracted to the surface of the metallic part evenly. Every mole of electrons that are transferred to the part, allows one mole of metallic ions in the solution to adhere to the part during the bath process. A chemical reaction can subsequently occur where the reduction and oxidation of ions takes place. Specialist plating facilities are able to plate a large array of different base materials to protect various surfaces. Electroless nickel plating is a high quality but cost effective coating solution which can drastically extend the life expectancy of a stainless steel component. This is due to the metal layer deposited by the electroless nickel coating creating an even thickness across the components surface, despite its shape. This makes electroless nickel plating very popular in sectors such as the defence, health, automotive and aerospace industries. us are a Derbyshire based company in the UK and are leading specialists in the plating industry. We offer a large array of well-developed high-end techniques which are cost effective and readily available for you. We have extensive experience of working for industries, including that of the aerospace, medical, army and automotive sectors and offer our services to the UK holistically, France, Germany, Holland and Brazil. So, if you are interested or are in need of plating, such as electroless nickel plating, copper plating or heat treatments, then contact us today by calling our friendly and professional team on our phone number, email us at info@metal-finishing-company.co.uk or alternatively you can click here to be taken directly to our website and view the services we offer for yourself. designers for over half a century. ENP is a high quality, cost effective solution to coat metals like stainless steel. ENP can dramatically elongate a components longevity. ENP deposits a metal layer of equal thickness all over the surface of a component, despite its shape or size. The uniformity of the coating is favoured by engineers working in the industries of defence, healthcare, automotive and aerospace. ENP is highly corrosion resistant, so is ideal in harsh environments like the marine, oil, gas and defence industries. ENP prevents rust formation from occurring. Due to ENP’s corrosion resistance, it reduces the cost and frequency of repairs and replacements needed on stainless steel parts (for example). The quality of components coated with ENP noticeably improves. ENP acts as a protective layer from wear because it is self-lubricating and therefore reduces the friction of the component in question. When a component is EN plated, it is guaranteed not to chip or flake, unlike other substances used as top coats, such as paint or lacquer. ENP can be hardened up to 950vhn through the use of heat treatment if substantial friction and wear are issues. Pit-free deposits are created using ENP. ENP acts as an excellent adhesive to other substrates like aluminium and copper. ENP causes components to have a lower percentage of porosity. Components are non-magnetic after being EN plated. Staining is much less likely to occur once ENP has taken place. us are a Derbyshire, UK, company, who are experts in the process of electroless nickel plating or ENP for short. If this process is something you or your business would like to find out more about, then please give our friendly and professional team a call on our phone number, send us an email at info@metal-finishing-company.co.uk or alternatively you can get in touch with us through our contact page. Visit our website to find out more about other metal plating services, too, such as diffused nickel plating, copper plating, shotblasting and aqua blasting. As specialists in electroless nickel plating, us have put together 5 things we think you need to know about the process! Electroless nickel plating is an auto-catalytic chemical reaction used to deposit nickel onto a wide range of substrates. It uses a solution containing nickel phosphorous alloy, which can be specially tailored to suit the application it is being used for. Electroless nickel plating has many key properties that make it an excellent choice for any metal plating project. For example, electroless nickel coatings are incredibly corrosion and wear resistant, as well as being very hard. Electroless nickel plating provides a highly accurate and uniform deposit onto the surface of a component, regardless of the complexity of the part. It can easily plate sharp angles and curves, deep holes and recesses, making it a fantastic choice of plating for unusually complex parts. Typical applications for electroless nickel plating include valves, pumps, mould tools, gears, sprockets and splined shafts, and electronic components. The process has been widely used throughout most engineering disciplines; especially automotive, offshore, defence, aerospace, petrochemical, electronics, plastics and nuclear. It is highly recommended for offshore applications as it offers the very best levels of protection. Electroless nickel coatings can be used in a wide variety of common applications. The superior corrosion resistance, hardness levels and wear resistance make it a very versatile coating. Electroless nickel coatings have the perfect properties for use in the aerospace industry, for example, they can be used in the protection of hydraulic control systems. Nickel coatings can also be used for the refurbishment and the recovery of worn machined parts. They can also be used to correct incorrectly machined parts enabling the component to be used. Nickel coatings are used for electrical and electronic applications due to their ability to protect the components successfully. 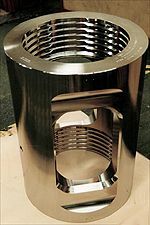 For example, electroless nickel coatings may be used for electrical connectors and hard drive computer components in order to impart corrosion protection and wear resistance. They are also useful for providing solderability and a non-porous barrier layer, and to otherwise enhance the performance or useful life of a particular component. The automotive industry has specified electroless nickel plating on brake, transmission and steering assembly components, in addition to other parts. Electroless components enhance performance, and with longer lasting parts, they can help automakers to extend their product warranties. Electroless nickel coatings can be used for chemical and wear resistance to equipment in the oil and gas industry. It is also useful for coalfield cutting tools, as it provides a wear resistant coating that doesn’t carry the risk of sparking. Electroless nickel plating can be used in a wide variety of applications within general engineering. For example, it can be used for wear resistance in plastics and textile handling equipment, corrosion resistance in chemical handling plants, appearance, and wear resistance in automotive applications. If you are looking for a metal coating that is suitable for a variety of applications and industries, electroless nickel is the perfect solution. Call us on our phone number, email us at info@metal-finishing-company.co.uk or visit the contact page on our website to make an enquiry. After an eventful 2013, this year is set to be equally as exciting here at us. We are pleased to have received planning permission to have an extension built onto our metal finishing factory, which will create an extra 3,000 square foot of space. This extension will allow us to be able to install a 7th electroless nickel plating line, meaning that we will be able to respond even more quickly to our customers’ plating needs. This specialist electroless nickel plating line will create 5 new jobs at us, and will be in full operation in February 2014. We will also have a state of the art crane installed over the plating line which will allow us to handle components of up to 20 tonnes. Here at us, we are often approached by companies with specific plating needs for bespoke applications. We were approached by Rutherford Appleton Laboratories, who had manufactured a large vacuum chamber that they wanted plating with a thin layer of electroless nickel. Without plating, the iron from the walls of the chamber would compromise and possible affect the results of the tests carried out inside it. Lasers used during testing would also cause damage to the chamber walls without a layer of electroless nickel. The facilities at Rutherford Appleton Laboratories are used by scientists and engineers in order to advance their research into materials and structures, light sources, astronomy and particle physics. Every year about 10,000 scientists and engineers use the Laboratory’s facilities to advance their research. Many are academics and post-graduate students working on projects funded by the Science and Technology Facilities Council. Rutherford Appleton Laboratories had manufactured the large vacuum chamber for tests that involved lasers travelling down the centre of the chamber. This area needed to be plated with a layer of electroless nickel so that the layers did not burn through the paint during testing. The vacuum chamber came in a number of large sections, some which weighed more than 20 tonnes. The team at us manufactured tanks to fit each part of the chamber that needed to be plated. The main body of the chamber weighed 150 tonnes and was built like a small room, containing many windows, portals and doors. Blanking plates were manufactured for each of the chamber components, and the chamber was then sheeted over and manually and internally shot blasted. Originally, the chamber was going to be used as the plating tank and filled with electroless nickel plating solution. But the portals and windows contained recesses which were identified as gas traps and to overcome this and ensure complete coverage of the electroless nickel plating, all of the blanking plates were fitted with small air pipes. These fed up the outside of the chamber and back into the top, removing gas and solution and ensuring complete coverage. If you would like to find out more about our electroless nickel plating services call us on our phone number, email us at info@metal-finishing-company.co.uk or visit the contact page on our website to make an enquiry. The corrosion protection provided by electroless nickel plating can extend the life of a component. This is due to its ability to block the formation of rust on a component, which in turn stops it from becoming a catalyst for part on part rusting. This has massive advantages in all industries because it is not necessary to worry about one bad part contaminating the rest, or it jeopardizing the final assembly of the product. Electroless nickel also improves the quality of components because it allows for tight manufacturing tolerances. This is because electroless nickel creates a uniform build-up of nickel on all surfaces, regardless of their shape and dimensions. It can also be used to build parts that may have been out of specification back into tolerance. By using an electroless nickel coating on worn parts, they will be reusable in the capacity of post machining and other post finishes. The advanced properties of corrosion protection that electroless nickel can offer means that components can be manufactured from a less expensive metal and coated using nickel. By not having to make the part out of a more expensive metal, profit margins can therefore be increased. The wear protection provided by electroless nickel can also extend the life of a component. An electroless nickel coating will reduce wear of a part due its self lubricating properties and high levels of hardness. This means that there is minimal weight loss on the coating from part on part friction. Electroless nickel also provides outstanding release properties and anti stick surfaces. Electroless nickel coatings won’t chip off, flake, peel or rub off like some paint or lacquer type top coats which have been applied without pre-surface treatments. So there’s also no need to worry about the strength of the coating. If you are looking for a metal coating that has outstanding levels of wear and corrosion resistance, electroless nickel is the perfect solution. Call us on our phone number, email us at info@metal-finishing-company.co.uk or visit the contact page on our website to make an enquiry. Nickel coatings are often used in the aerospace and aircraft industry because they are an effective corrosion resistant coating at high temperatures. This means that they are capable of protecting airfoil components from abrasion and erosion by providing a surface coating that will allow high nickel/chromium alloy parts to be joined by brazing or welding, to produce nickel or nickel alloy components for space applications and to repair worn or damaged components. By repairing parts rather than replacing them, they can continue to be used rather that scrapped. Nickel and alloys of nickel are often used for space applications. How Are Nickel Coatings Used in Aircraft? Nickel coatings are often used on various parts of aircraft due to its fantastic properties of corrosion resistance and hardness. Needless to say, the Aircraft industry has an ongoing need for nickel plating. Corrosion resistance at high temperatures to protect airfoil components from erosion and abrasion. Provides a coating that will allow high nickel/chromium alloy parts to be joined by brazing or welding. To repair worn or damaged components so that they can continue to be used rather than scrapped.